The ActivEpi Companion Textbook Second Edition supplements ActivEpi Web and the ActivEpi CD-ROM. Because individuals differ in their learning skills, the ActivEpi Web, CD-ROM and ActivEpi Companion Textbook offer readers different but related options on learning epidemiology. The Companion Textbook can be used as a hardcopy reference of the materials contained on the Web and CD-ROM, as a resource for the practice exercises, as a general references, or even a self-contained textbook. The ActivEpi Companion Textbook is 546-pages and all of the textual material on the ActivEpi Web and CD-ROM and a large number of screen captures are included in the ActivEpi Companion Textbook. Some of the narrations on the ActivEpi Web and CD-ROM were altered slightly in the Companion Textbook to accommodate references to computer animations. Another difference between the CD-ROM and the Companion Textbook is that the Study Questions and Quizzes in the Companion Textbook are sequentially numbered throughout each Lesson, with the answers provided at the end of the lesson; on ActivEpi Web and CD-ROM, the answers are provided interactively. There are interactive activities on ActivEpi Web and CD-ROM that cannot be directly duplicated in the Companion Textbook. One advantage of the Companion Textbook is that at the end of each Lesson are a reference section and a summary of the nomenclature and formulae. We believe that the combination of both the ActivEpi Web and/or CD-ROM and Companion Textbook provide the optimal learning experience, whether they are used for a traditional classroom-based course, in a distance learning course, or for independent study. 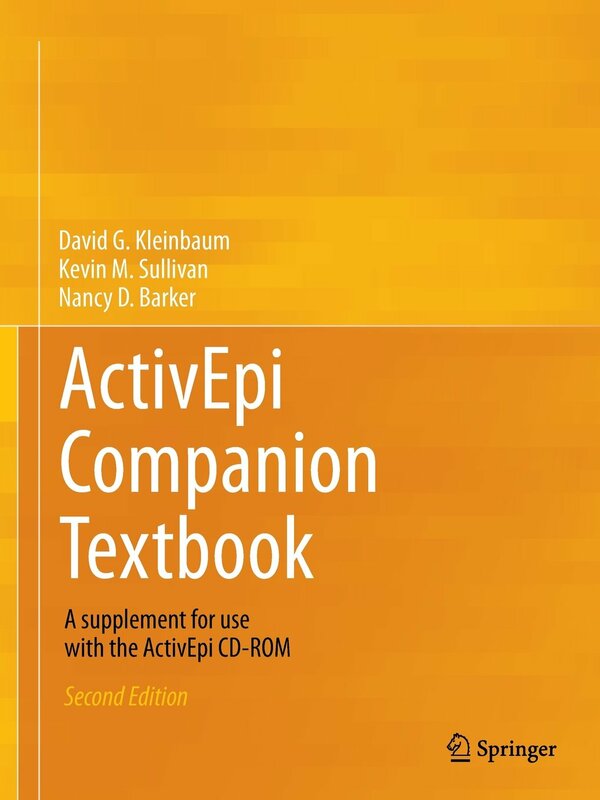 We recommend using ActivEpi Web and CD-ROM for initially reviewing the material and using the Companion Textbook to highlight areas of interest, and then use the Companion Textbook for preparing for exams or as an epidemiologic resource. As with ActivEpi Web and CD-ROM, the Companion Textbook contains Homework Exercises but does not provide the answers to these exercises. The answers can be obtained by writing one of the authors (dkleinb@.emory.edu).